Post a short description of your problem in the support section of the forum . Do not create topics with names such as 'EVE Miner NOT WORKING!!!' Give your thread a more specific name for future reference. Explain how the error or condition has occurred, including the sequence of actions leading up to the error condition, error messages...etc. If you use a virtual machine please make a note of this. Send your log files to and link to your forum post in the email. Logs for each client are separated and shown in different tabs. The only log you should send is a log of the client. Log of a client is recorded in tabs 'Client 0-9'. General log is required by request only and recorded in 'Other' tab. 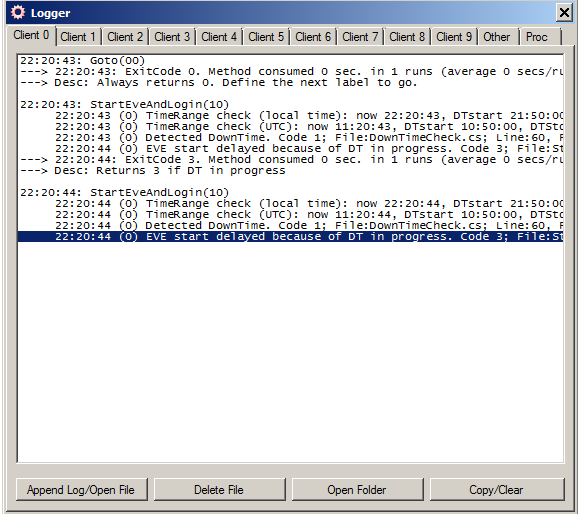 Pause the program with Control + p and switch to the logger, click 'append log/open file'. The current log will be opened in a text editor where you are able to find the filename. Close the text editor and click 'Open Folder', find the filename of the log, and copy it locally. Compress log to a zip, rar or 7z archive and send it to . Dont make too short log, wait at least 30 minutes or till bot close eve window after error. In is a good practice to start recording log from first run. When you click continue button you also continue recording log file.